The competition was strong with the organisers receiving nominations from industry-experts and Octane-readers around the world. The Historic Motoring Awards nominations were then whittled down to 18 select categories to honour the industry’s elite. The range of categories was broad, with awards for motoring book or film of the Year, ‘Club of the Year’ and ‘Bespoke Car of the Year’, to name but a few. The Hub’s category had some of the car world’s biggest and most recognised specialists, including GTO Engineering, William Medcalf Bentley Jim Stokes Workshop. Formula One pundit and expert awards host Steve Rider was on hand to compère the evening and present the awards after a delicious 3-course dinner with ample alcoholic hydration. The Hub’s category was the 9th to be called and to our absolute surprise and delight we were announced as the 2018 Specialist of the Year. Hub founder Martin Chisholm went on stage to collect the award, presented by Stuart Quick of Quickfit SBS. All the colleagues who attended (and those keeping tabs on us remotely) felt very proud indeed to be a part of The Classic Motor Hub’s success. To win this award after just 2 and half short years of business is a real testament to everyone’s hard work and a shared vision of The Hub’s success. 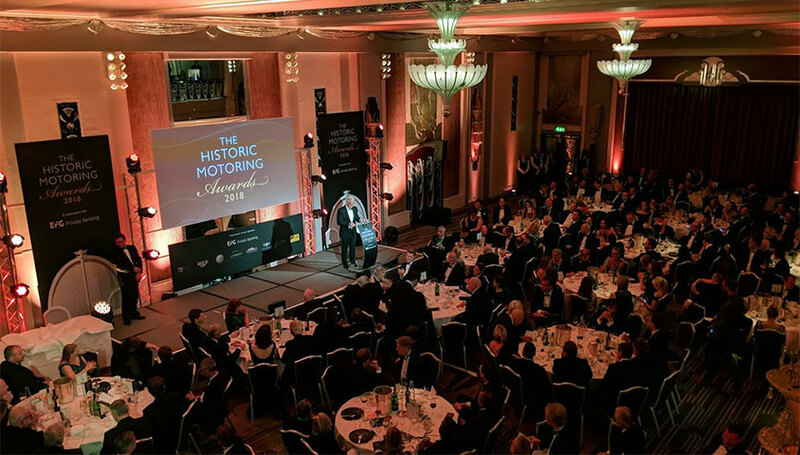 The celebrations after supper were fantastic and (after several bottles of champagne) the Historic Motoring Awards party started to fade, but the Hub team relocated to the 28th floor of the Hilton Park Lane to continue the celebrations overlooking the bright London skyline. The rest of the night cannot be clearly defined but all members of The Hub team (eventually) got home safely in the early hours of the following morning. Here at The Classic Motor Hub our success has not been defined by one single aspect, which is why being chosen in this category seemed rather fitting. Whilst our main business is indeed classic car and motorcycle sales, we also offer a wide range of other services including storage and transportation. Meanwhile, our Coffee & Classics events have grown at a rapid pace throughout 2018, and are now considered one of the regular “must-visit” events by motorists far and wide. In April of 2018 our on-site shop opened to the public and now offers a wide range of gifts and memorabilia for the motoring enthusiast, and earlier this year we also started offering on-site detailing services for cars and motorcycles. You can read more about these and the other facilities we offer on our services page. Next year we have a full calendar of motoring events planned, kicking off with our New Year’s Day Charity Meet on Tuesday 1st January between 12pm and 3pm. If you’d like to join us at any of our events, registration is mandatory as each event does sell out days if not weeks beforehand. Once again, thank you to all those who have visited us, bought or sold with us, or supported us in any way over the last couple of years – we look forward to growing even further with your help. Want to find out more about the people behind The Hub? Visit our About Us Page to find out more about us.